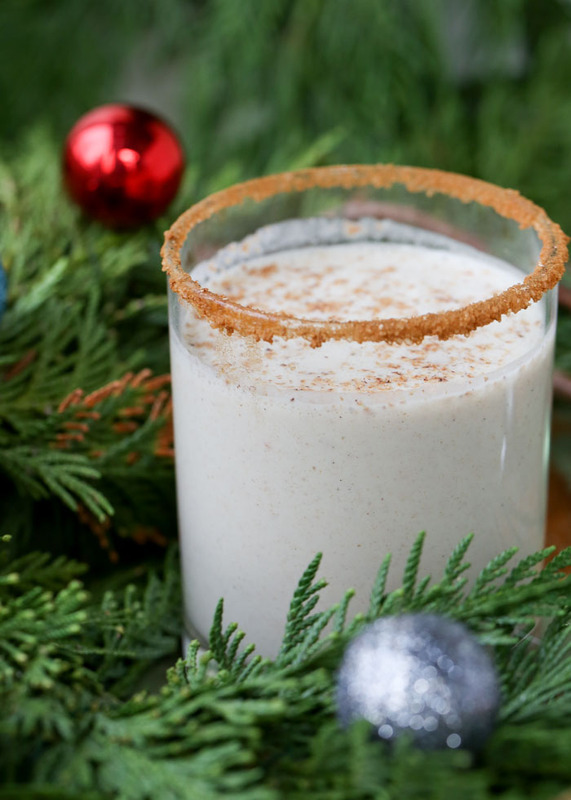 Growing up, we really weren’t an eggnog family. My first encounter with it, I think, was actually well into adulthood – in the form of an eggnog latte. That easily segued into the real stuff whenever possible every December. Eu-frickin’-reka! What had I been missing?! Cue record screech when, many years later, I discovered dairy hated me. Well, shoot. There goes eggnog. Christmastime took on a dull glow from there on out. (Just kidding, but it was a bummer). And then I discovered Vegan Eggnog! (And now we hear angels singing.) Because seriously, this stuff is unbelievably delicious. The first version I tried was this one, and when I first sipped it, my eyes widened and I was like, okay, forget the traditional stuff. Where has THIS been all my life? After that, I ventured into chai-spiced territory, which is really nice when I’m wanting a special twist. 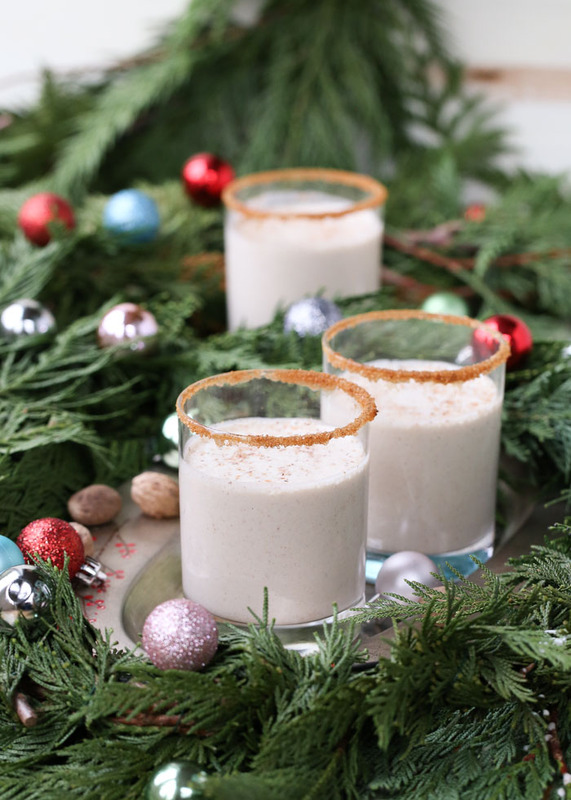 But more often than not, this Easy 6-Ingredient Vegan Eggnog is what I’m all about every December. 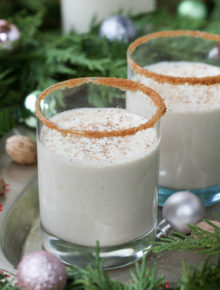 I took the inspiration recipe and ran with it, changing up the quantities until I landed on, in my humble opinion, vegan eggnog perfection. We’ve got cashews, coconut milk, dates, vanilla, nutmeg, and sea salt. And that’s it! Okay, and a little water, but I don’t count that. 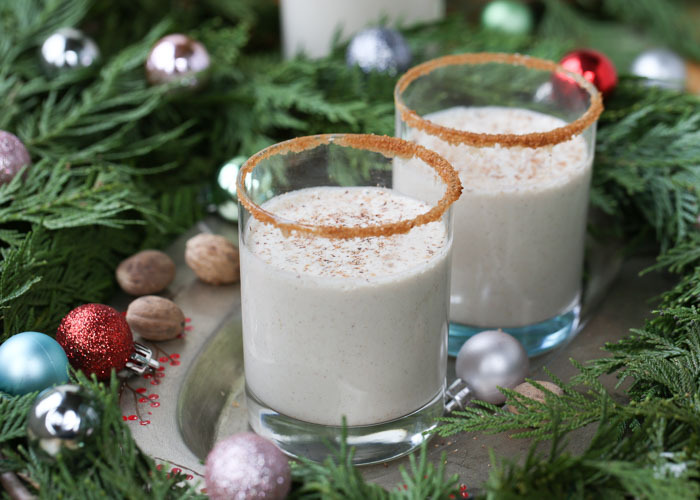 Cashews give this egg nog that luscious creaminess, while coconut milk adds a rich sweetness. Caramelly sweet medjool dates help thicken it up while adding an almost molasses-y note. Vanilla – either in the form of vanilla bean paste, pure vanilla extract, or even couple of vanilla beans, is a must. And then copious amounts of nutmeg. Because of course. Just blend it all up, chill, and done! It’s SO EASY. 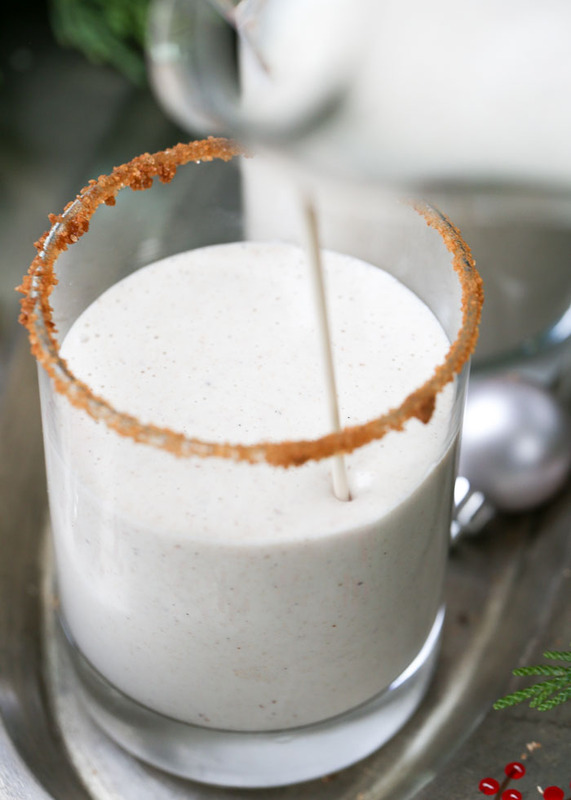 Whether you’re vegan, dairy-free, or just not so sure about the idea of drinking egg, I encourage you to give this Vegan Eggnog a try, and I hope you love it as much as we do! Place all ingredients, starting with 8 of the dates, into the pitcher of a large high-speed blender. Puree until smooth. Taste; add and puree additional dates if you’d like it a bit sweeter. Refrigerate for at least an hour to chill. Serve, adding a bit of rum to each (adult!) serving if desired. Keeps refrigerated for 4-5 days. For optional cinnamon rims, mix sugar and cinnamon in a saucer. Pour a bit of water in a second saucer. Lightly dip the rims of the glasses first into the water and then in the cinnamon sugar mix. Voila! 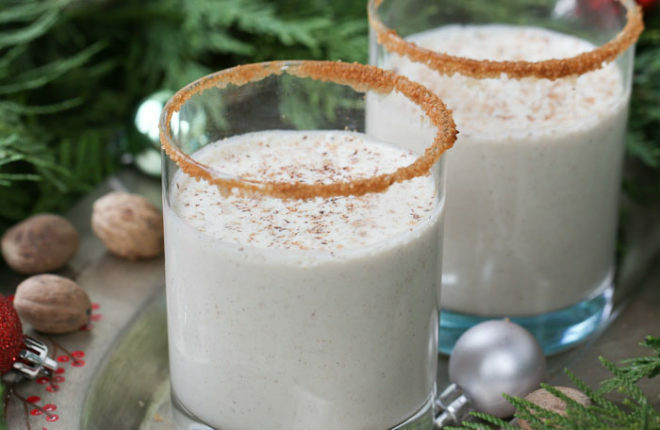 If the egg nog thickens up more than you’d like after chilling, puree with a bit more water to loosen it back up. You can also freeze it! Just thaw in the refrigerator, add a bit of water, and puree until your desired consistency. 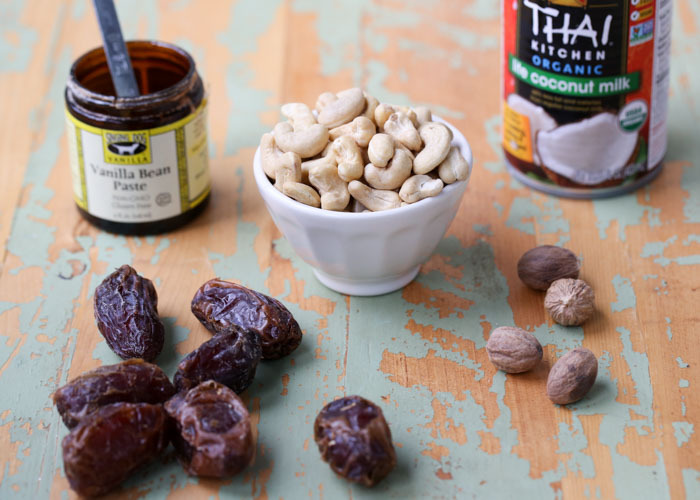 * To soak cashews, add to a heat-safe medium bowl. Pour boiling water over the top. Let sit for 20 minutes. Pour off water and rinse. Cashews can also be soaked in lukewarm or cold water, they just need more time to soften (between 4 and 12 hours). ** Recipe time includes including cashew soak time and chilling time. Hands-on time is more like 10 minutes, if that.